Interesting Antique Textiles: Coming soon to the V & A - I cant wait! Coming soon to the V & A - I cant wait! Four tapestries designed by Raphael for the Sistine Chapel almost 500 years ago are to be displayed at the Victoria & Albert Museum in London in September.The tapestries will be shown alongside their full-sized original designs, called the Raphael Cartoons, which have been on display at the V&A since 1865.It will be the first time they have been shown together. V&A director Mark Jones said it was "a marvellous opportunity to see great Renaissance masterpieces reunited". The six-week exhibition will coincide with Pope Benedict XVI's historic visit to Britain. 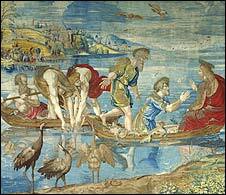 Raphael was commissioned by Pope Leo X to design the works - The Miraculous Drought of Fishes, Christ's Charge of Peter, The Healing of the Lame Man and The Sacrifice at Lystra - which were woven in Brussels and sent to Rome for display.The four - part of a series of 10 - are the only tapestries designed by the Renaissance artist, of which examples survive. The tapestries are owned by the Vatican Museums, while the cartoons belong to the Queen.The seven cartoons have been on long-term loan to the V&A since the reign of Queen Victoria and are too fragile to leave the museum building. Tickets to the exhibition are free and will be available from 1 July. Oh how lucky you are to be able to see these. Never miss opportunities like this when they avail themselves to us.